Want to boost referrals and create lifetime clients? Do you want your employees to feel like the superstars they are? Then give a high-quality, useful gift. Whether you're looking for a small drop-by or referral gift, or something special for a big closing or event, we've rounded up our best offerings into this helpful guide. Happy giving! Crafted from polished stainless steel, then powder-coated for a lifetime of use. With a tapered edge for opening boxes and a magnetic back, it's truly one-of-a-kind. 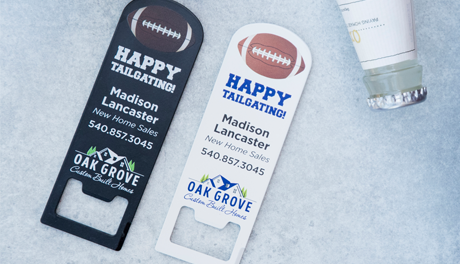 Ideal as open-house or tailgating favors. Also available in house-shaped. $2.77 each at quantity 100. The SuperScraper XL tackles big cleaning jobs, all while promoting your business. 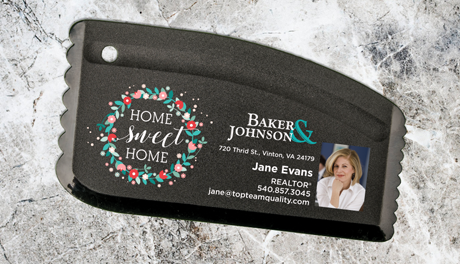 Removes ice from windshields, scoops chopped foods, quickly scrapes cookie sheets, glass dishes and more. Teethed side cleans grills. It's aslo flat enough to be mailed! $3.75 each at quantity 100. A kitchen must-have! Infinity Stainless Steel Soap quickly removes fish, garlic and onion odors from your hands. 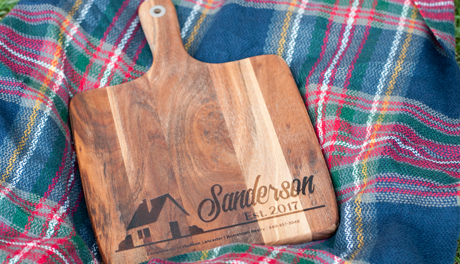 Both sides can be engraved, making it a memorable gift for the cook or fisherman in your life. $15.75 each at quantity 12. Part tongs. Part slicer. All you need. 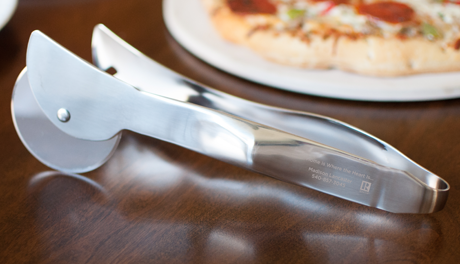 Perfect for casual office lunches and family gatherings, these stainless steel pizza tongs harness the power of two pizza essentials. Engraving encluded. $27.70 each at quantity 12. Nostalgia meets modern technology in this vintage-style serving spoon. The full-tang, rosewood handle is infused with a powerful phenolic resin to give it the water-resistant durability of plastic. Guaranteed not to bend. Perfect for ice cream and casseroles. $34 each at quantity 12. 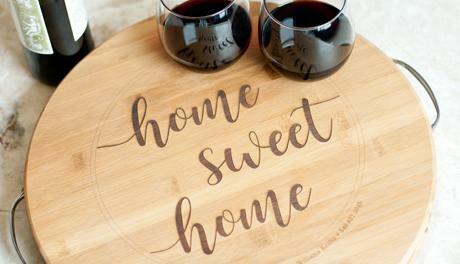 Beautifully gift a bottle of wine in this personalized keepsake box. 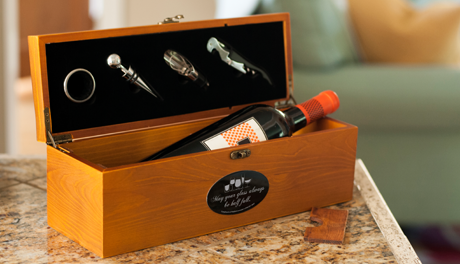 Each box includes a stainless steel drip collar, bottle stopper, aerator/pourer and corkscrew with bottle opener. Also available in cherry and black finish. $24 each at quantity 12. Crafted from handsome acacia wood, the cheese serving board features warm hues and unique wood grain markings, so no two are exactly alike. Choose from nine different engraving designs. 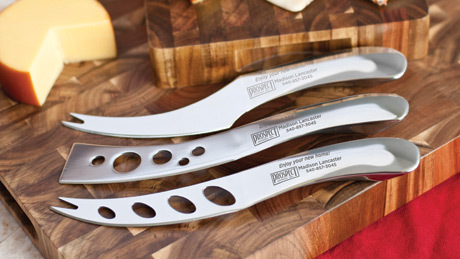 These artfully crafted cheese knives are the perfect gift for anyone who loves to entertain. Designed to take on both firm and soft cheeses, this set will become a party staple. Pair with a bottle of wine for an impressive gift. Engraving included. 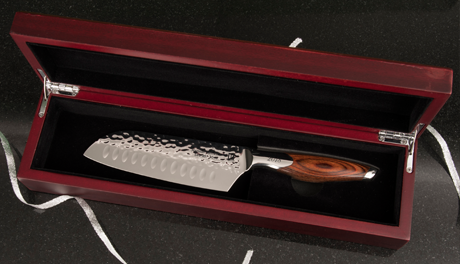 Defined by superior craftsmanship and innovative design, the new Masterpiece Santoku features high-carbon German steel with a hammered finish. Boasting a 5.5" blade, this knife is the ideal length for the average home chef. 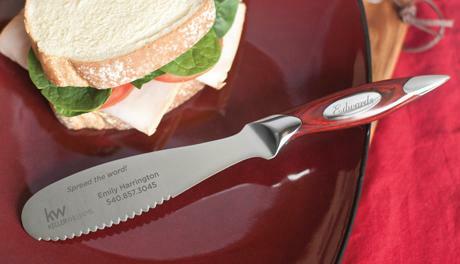 Made from high-carbon German steel, the Sandwich Shark's flexible blade makes spreading condiments easy. The scalloped edge effortlessly slices meat, veggies and bread. Did we mention it's great for serving cakes and pies, too? Engraving included. 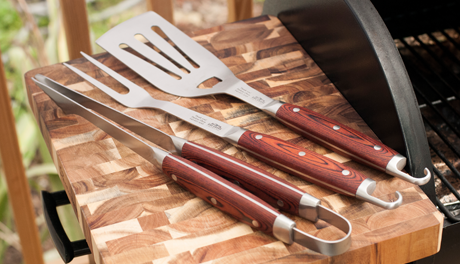 Complete with heavy-gauge stainless steel tongs, spatula and fork, this set is the perfect wingman for any backyard barbecue. 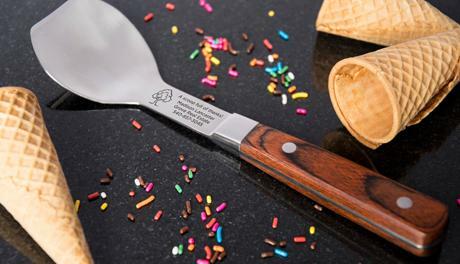 The spatula features a built-in bottle opener, so the party never has to pause. Wow recipients with this beautifully crafted bamboo cutting board. Sleek metal trim and handles allow it to double as an elegant serving tray. 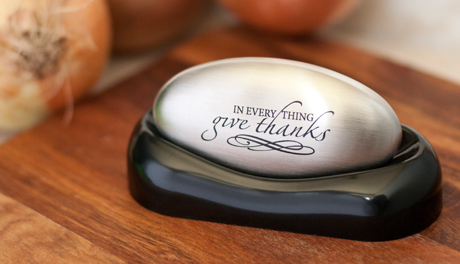 Engraving makes it a gift that rises above the rest. $77 each at quantity 1. 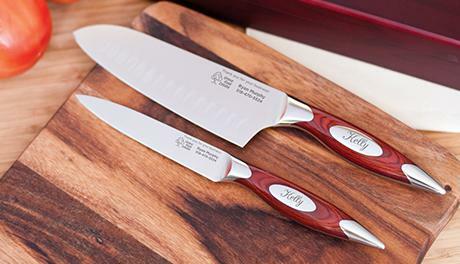 This beautiful chef knife duo will help you take on any recipe, from simple and fresh sides to complicated main courses. 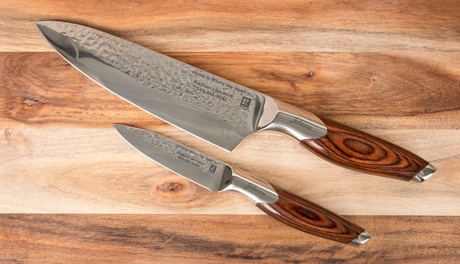 Featuring mirror-polished, hammered German steel and rosewood handles, this pair is idea for prepping just about anything. 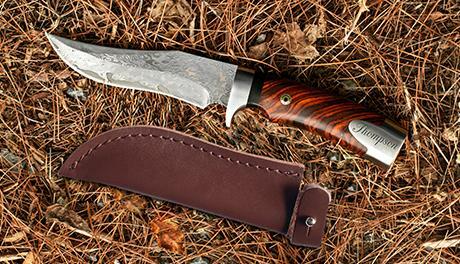 Whether you hunt, camp, fish or hike, this limited-edition knife will remain a steadfast companion. Made with 67-layer Japanese VG-10 steel, it holds an edge like no other. Limited edition certificate included. 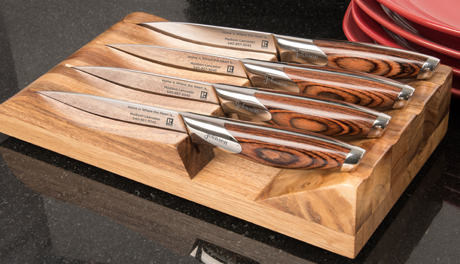 Impress recipients with this gorgeous set of mirror-polished German steel steak knives. Boasting razor-sharp edges, these incredible knives help keep flavorful juices inside the meat. Displayed in a cherry-finish wood box.